Apparently Good Housekeeping now has a green seal of approval. UL laboratories, the safety test lab, also has it’s own green seal of approval. In fact, according to the new 2009 Conscious Consumer Report from BBMG, there are now over 400 different certifications related to “green” and environmental attributes of products and services. So many that such marks risk losing their effectiveness. Steven Colbert said that they now had a “Green Colbert Report” – they’re reducing their emissions by jumping on the bandwagon. And like all comedy, it only hurts when we laugh. Since we’re all about textiles, let’s focus here. Do you even know what certifications pertain to textiles? The market is absolutely rife with claims about organic cotton – and believe me, I have absolutely nothing against organic cotton. But the focus (by marketers and consumers alike) is that if it’s made of organic cotton, then the product is sustainable. That’s far from the truth. We like to use the analogy of “organic applesauce” – that is, if you take organic apples, then cook them with preservatives, emulsifiers, Red Dye #2, stabilizers and any number of other additives – do you end up with organic applesauce? Just like bread – which is made from wheat which is grown (maybe organically), harvested, ground into flour, mixed with milk, yeast, salt and maybe other things, then baked – fabric undergoes the same type of transformation. I mean, really, do you actually think that the cotton boll which you see in the picture is transformed into your blouse without some kind of serious work? What about oil? Think of crude oil and and your new sheets – what do you think has to have happened to that crude to make it acceptable for your bedroom? 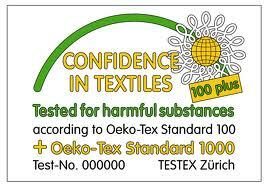 So the certifications which are often used for fabrics have only to do with the FIBER, and not with the processing. The processing is environmentally damaging and results in fabric that contains many chemicals that seriously jeopardize our health. And often a product is advertised as being an “organic fabric” when what they mean is the fabric started out with organic fibers – but the processing, like the organic applesauce mentioned above, results in fabric that contains a high proportion, by weight, of synthetic chemicals (such as lead or mercury, formaldehyde, chlorine, or phthalates). Besides the proliferation of certifications, further muddying of the waters happens because some of the certification agencies which can certify fabric ALSO certify fiber. In other words, each end product can be certified. So if we deconstruct a piece of fabric, we can have certification at each stage: (1) growing and harvesting of organic fibers (2) ginning or other preparation of the fibers to make them suitable for use in spinning; (3) spinning of the fibers into yarns; (4) weaving of the yarns into fabric and (5) final product (i.e., blouse, tablecloth, etc.). Makes you dizzy doesn’t it? It’s quite common to find “organic cotton” fabrics in the market – in other words, fabrics made of organic fibers. Or at least, the claim is that the fibers are organic. Unless they are certified organic fibers, the claim is meaningless: there are no standards for calling a natural fiber “organic” since by definition they are organic – because the definition of “organic” is “of, relating to, or derived from living organisms.” There is a big difference between a fabric or product which claims to be “organic” and one that claims to be “certified organic”. So it is important to look for the certification and ask who certified the fibers (if they don’t display that information). Believe me, if a company has gone to the trouble and expense of certifying their fibers, they will definitely have the information of who did the certification! Soil Association Certification Limited (SA Certification) is the UK’s largest organic certification body. It’s also the only certification body linked to a committed charity, promoting organic food and farming. The Institute for Marketcology (IMO): IMO is one of the first and most renowned international agencies for inspection, certification and quality assurance of eco-friendly products. Its world-wide activities are accredited by the Swiss Accreditation Service (SAS) according to EN 45011 (ISO 65), which is the international standard for certification. IMO offers certification for organic production and handling according to the European Regulation (EU) Nr. 2092/91. The certifications above verify that the fibers have been grown and harvested to organic standards set forth by the various standards. But they do not deal in any way with the processing of the fibers into fabric. 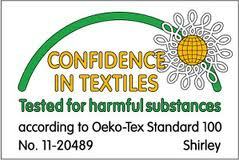 There exist several third party certifications which we think every conscious consumer of fabric should be aware. We should all know what the certification does – and doesn’t – cover: Oeko-Tex, GOTS, C2C, GreenGuard, Global Recycle Standard and SMART. Before giving a summary of the main points of each of the certifications which deal with fiber processing (i.e., weaving), it’s important to note that these certifications are all in business – it costs money to achieve the certification – sometimes it costs a LOT of money. Like organic designations in food, some farmers, for example, grow hemp sustainably (because they can). But because there isn’t a robust market yet for hemp they don’t want to spend the money for the certification to show it as organic. Cradle to Cradle and GreenGuard can cost up to $30,000 per product for certification, so when you look on the web sites for these certifications, you see only large, well established companies who can afford to pay the certification costs. In addition to these certifications, there are many new “green guides” on the internet which purport to list green products. A basic listing may be free, but any additional bells and whistles costs money. So prominently featured green products may be specially featured because the manufacturer has paid for the spotlight. GreenGuard (www.greenguard.org). GreenGuard is not designed specifically for fabrics, but it is often advertised that a fabric is GreenGuard certified. GreenGuard has developed proprietary indoor air-quality pollutant guidelines based on government and industrial bodies. Those products that pay the testing fee and pass muster earn the right to call themselves GreenGuard certified. It was launched in 2000 by Atlanta-based for profit Air Quality Sciences (AQS), which is now a separate not for profit organization. GreenGuard tests for the emitting chemicals coming from a product; that means it tests only for evaporating chemicals, chemicals which are a gas at room temperature. And that is all GreenGuard does – it does not look at the production of the fabric, or any social justice issues nor does it look at carbon footprint. It does not measure phthalates (except in the Children and Schools certification); phthalates are semi volatile, and don’t begin to evaporate until approximately 7 days after exposure to the air. 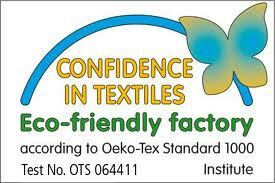 Oeko Tex (www.oeko-tex.com): founded to provide an objective and reliable product label for consumers and a uniform safety standard for the assessment of harmful substances in fabrics. Its aim is to ensure products are free of harmful substances. Biologically active products and flame-retardant products are regulated separately. Oeko Tex is a registered trademark. Make sure that the test number is quoted and the test institute is named as shown on the logo above. This certification does not look at the processing or manufacturing (whether wastewater is treated, for example, or renewable energy is used to power the mill) – it is solely concerned with the final product. There are also no social requirements. Cradle to Cradle (www.c2ccertified.com) : primarily it certifies that the product uses environmentally safe and healthy materials – however the list of what is considered safe is proprietary so we have to take their word for it. In other words: they’re not transparent. C2C certifies just the product, without looking at how it is installed or used. It has an energy, water and social responsibility component. All ingredients are rated: green, yellow, red (which has been ascertained to be toxic) or grey (incomplete data, handled like a red). To achieve Gold and Platinum levels, a product cannot contain any ingredients classified as RED – unless there are no existing substitutes. MBDC developed this database and it is not available to outsiders. All ingredients are classified as either a technical or biological nutrient: published C2C literature doesn’t define “recyclable” or “compostable” but MBDC uses European Union guidelines for biodegradability, and Federal Trade Commission (FTC) guidelines for recyclability. FTC guidelines require an established recycling pathway. For the energy component, it focuses on the manufacturer’s use of renewable energy in production. Manufacturers need to use renewable energy for the product’s manufacture to achieve Gold certification, and for the energy used in the product’s entire supply chain to achieve Platinum. Renewable energy may be purchased on site or purchased thru energy credits. Certification requires that companies work to preserve the quality and supply of water resources; implementation of these guidelines is required for Platinum. However, it’s easy to confuse the ideals and philosophy of the founders with the actual requirements for certification. For example, a C2C Silver doesn’t guarantee that a product is free of all red ingredients; the only “knockout” chemical at Silver is PVC. There is no report card for consumers that details what a certified product does or does not include. In addition, nutrients may not be returned to technical or biological cycles as described: the minimum requirement for certification is that a product be 67% recyclable or biodegradeable. But even a 100% recyclable product may not be able to return to either the technical or biological nutrient cycle. MBDC certifies just the product, without looking at how it is installed or used. HYCRETE (an additive to make concrete waterproof) is an example of how misleading this can be – when used as intended, HYCRETE is not biodegradeable and cannot be recycled by any established process. Yet the product can degrade – if you accidentally spill a five gallon bucket into a local stream, it’s going to degrade and isn’t going to do any harm. Yet if used as intended it can neither biodegrade nor be recycled. C2C criteria does not refer to manufacturing byproducts or the waste and energy use associated with resource extraction (such as is the case with polyester). Also the energy and water use standards focus on manufacturing, leaving out the energy and water consumption that results from use of the product. EXAMPLE: Kynar (coating on Formawall panels): uses fluoropolymer in mfring process which releases PFOA (bioaccumulative and likely carcinogen). But the PFOA slips thru the C2C assessment since it’s not a product ingredient. IN SUMMARY: C2C is distinguished by inspiring ecological thinking, affiliation with respected thought leaders and idealism. But it is complicated by a lack of transparency and gaps in underlying criteria; lack of boundaries between the C2C standards developing body, C2C certification body and the MBDC consulting body. They’re revising it now, but historically they have not looked at carbon footprint. The Global Organic Textile Standard (GOTS) ( http://www.global-standard.com; see also: www.organic-textile-services.com) is a collaborative effort between the United States Organic Trade Association, Soil Association, International Association Natural Textile Industry (IVN) and Japan Organic Cotton Association (JOCA) to codify textile standards so consumers and manufacturers have one certification – an important step toward harmonization and transparency in textile labels. Since work began on codifying the Global Organic Textile Standard (GOTS) in 2002, it has evolved into the leading set of criteria in the field of organic textile processing. There are detailed social criteria: no forced or bonded labor; workers are not required to lodge “deposits” or identity papers with employer; no child labor; workers are free to leave after reasonable notice; working conditions are safe and hygenic. Wastewater treatment includes measurement and monitoring sediment quantities, waste water temperature and waste water pH. Wastewater from wet-processing sites (except greasy wool scouring sites and flax retting sites) must, when discharged to surface waters after treatment, have a COD content of less than 25 g/kg of textile output expressed as an annual average. If the effluent is treated on site and discharged directly to surface waters, it must also have an pH between 6 and 9 (unless the pH of the receiving water is outside this range) and a temperature of less than 40C° (unless the temperature of the receiving water is above this value). The COD/BOD ratio must be ≤ 5. The copper content must not exceed 0,5 mg/l. The GOTS certification applies to only natural fibers, it cannot be applied to polyester or other synthetic fibers. SMaRT Sustainable Products Standard (www.sustainableproducts.com): based on transparency, using consensus based metrics and life-cycle analysis. They also have in place rules which prevent industry trade association dominance so they can move substantially beyond the status quo. Renewable energy and conventional energy reduction are specified. SMART has a certification specifically for textiles called the Smart Sustainable Textile Standard. For textiles it requires 1300 chemicals be tracked and addressed; it is also transparent (i.e., nothing is proprietary or hidden in their requirements or in decision making). Confers multiple achievement levels. The Global Recycle Standard (www.certification.controlunion.com): This brand new standard was developed to help verify claims regarding recycled products. The Gold level requires products to contain 95 – 100% recycled material; Silver requires 70 – 95% and Bronze contains a minimum of 30%. The definition of “recycled” under this standard is based on criteria already laid down by Scientific Certification Systems. In addition, the standard contains environmental processing criteria and strick raw material specification (water treatment and chemical use is based on GOTS and Oeko-Tex 100) and social responsibility is incorporated – which ensures workers health and safety and upholds workers rights in accordance with International Labor Organisation (ILO) criteria.